The Panunzio awards are given to UC emeriti in the humanities or social sciences for their continued achievements after leaving fulltime service. Nauenberg is being recognized for his influential work on the history of science. "Being a UC Santa Cruz faculty member, I never believed in the arbitrary divisions between the disciplines, and I've always thought that we should have more discussions between the humanities and the sciences," Nauenberg said. "One reason I took early retirement was to have more time to indulge my interest in the history of science." Nauenberg is the sixth UCSC professor to win the Panunzio Award, named for Constantine Panunzio, a sociology professor at UCLA for many years, who is known as the architect of the UC Retirement System. Previous UC Santa Cruz winners are Hayden White, history of consciousness, 2001; G. William Domhoff, sociology, 2007; Thomas Pettigrew, psychology, 2009; Harry Berger Jr., literature, 2010; and Elliot Aronson, psychology, 2011. Only UCLA with seven winners has more. Also honored with a 2013 Panunzio Award is Fred Burwick, professor emeritus of English at UCLA. The award includes a $5,000 prize. Nauenberg, who retired from teaching in 1994, is an international authority on the history of physics and mathematics. Much of his work has focused on the 17th century and the work of Isaac Newton, Robert Hooke, and Christiaan Huygens. In the case of Newton, Nauenberg said he wanted to understand how Newton developed the ideas set forth in 1687 in the "Principia." He started reading the literature on the subject and soon became dissatisfied with the existing descriptions. "Newton is very difficult because he invented his own mathematical tools in a form that we don't use anymore," he said. "Most historians don't learn enough math and physics to penetrate it, and I know historians who have gone to their physics colleagues for help and they would come back empty handed, because you can't read Newton's original work and hope to learn it in an overnight effort. So I was filling a niche that had not been adequately covered." Nauenberg's contributions include research on the crucial role that Hooke's ideas played in helping Newton solve the problem of planetary motion. He helped organize a symposium on Newtonian scholarship, held at the Royal Society of London in 1997, and coedited a book on the proceedings with physicist Richard Dalitz. Nauenberg said he would like to see UCSC develop a sequence of courses in the history of science. "You have to understand the history of a subject to teach it properly and to understand it properly," he said. "Once something is understood, people try to present it in a very compact way, but if you leave out how this idea came into existence you're missing an important aspect of it." A founding member of the physics department, Nauenberg came to UCSC in 1966. He earned his Ph.D. in physics at Cornell University in 1960, after which he was a fellow at the Princeton Institute for Advanced Studies. He taught and did research in particle physics at Columbia University and Stanford University before joining the faculty at UCSC. 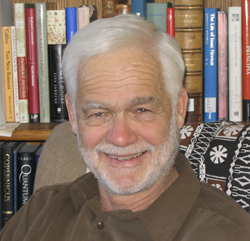 His fellow award recipient, Fred Burwick of UCLA, is an authority on Romantic drama who writes on the British, German and Italian opus of the era and lectures extensively in all three countries, as well as at seminars and conferences around the world.